As you might expect of a history festival, Wimborne’s fascinating Priest’s House Museum has been in the thick of the action Using items from its wonderful collection and the expertise of its team alongside several partner organisations to provide a range of projects and activities – Rotten Romans and Crummy Curators – as part of the Wimborne History Festival. In collaboration with Artz+ the Museum hosted a birthday party with a difference for disabled children aged 5-16 and their siblings. More than 30 years ago a Roman birthday invitation written on a wooden tablet was found near Hadrian’s Wall. Using this as inspiration the children created scrolls and wrote Roman style invitations, then made gifts including pendants, rings and torcs (neck ornament), as well as some delicious honey sweets. 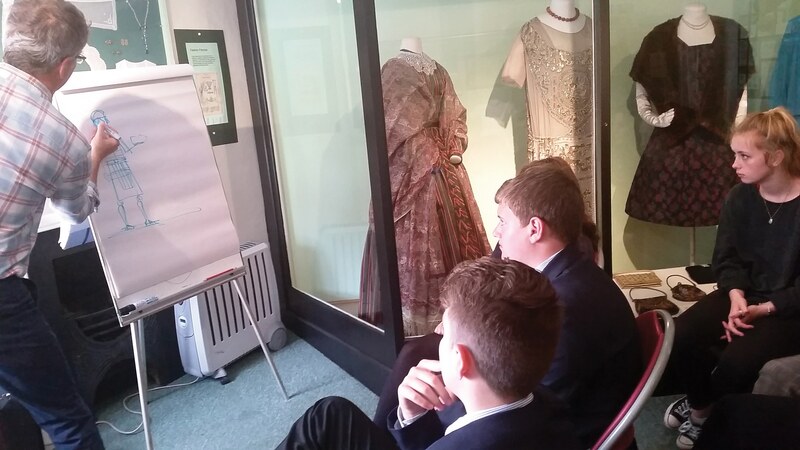 The Crummy Curators project gave children from Wimborne’s QE School the opportunity to learn how to curate an exhibition. Museum staff, Horrible Histories illustrator Martin Brown, graphic designer Richard Broadway an storyteller and creative write Sara Hurley worked with teams of students to select objects from the Museum’s archaeological collections and then showed how these can be interpreted through creative writing, illustration ad graphic design. Working with the professionals the students produced a series of panels that were on display over the History Festival weekend and will hopefully now go ‘on tour’. With able assistance from pupils of Merley First School, 3D artist Darrell Wakelam created a life size Roman Centurion, visiting members of the public were also able to get stuck in and help build this formidable looking figure. In July the Museum worked with Wimborne Library, storyteller Sara Hurley, and visual artist Nicky Bailey to produce poems and stories based on Roman objects from the Museum collections. An open family workshop for all ages, participants also had the chance to try their hand at making paper using a papyrus technique. Over the Festival Weekend the Museum opened its doors to a Roman Centurion and Soldier, who were on hand to talk to visitors about the Roman era. Visitors could try Roman dishes prepared in the Museum’s Victorian Kitchen, see local lace makers at work and enjoy a talk on the Roman period.